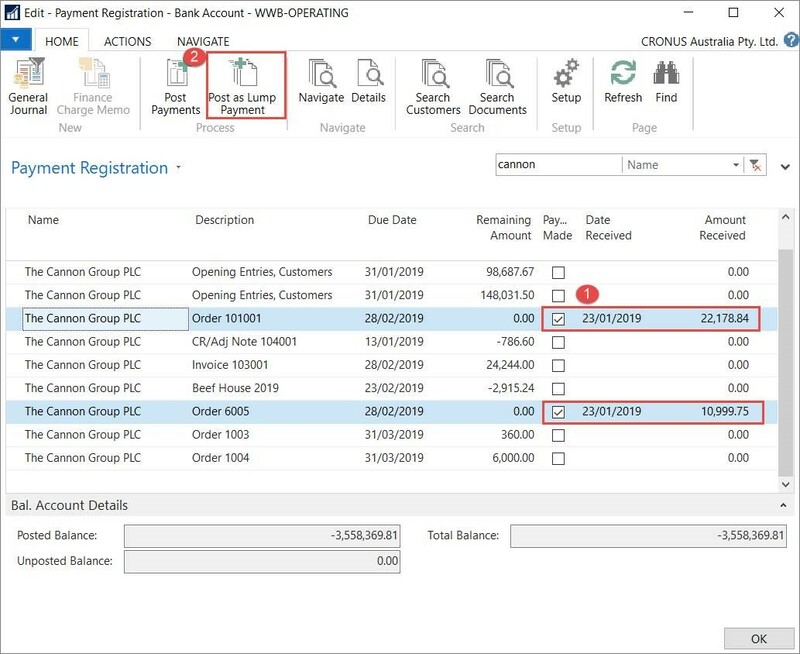 In Dynamics 365 Business Central there are a number of ways to perform the same function. In this post we will look at the Payment Registration function as an alternative to the Cash Receipts Journal. 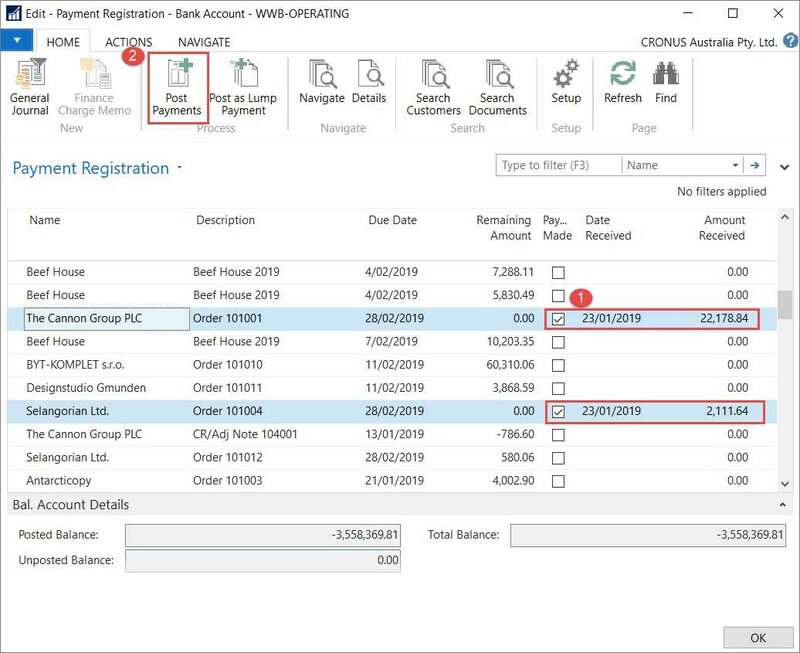 The most frequently used method of processing payments from customers is to enter a Cash Receipt Journal and use the Apply Entries function to manually attach the payment to a sales invoice. 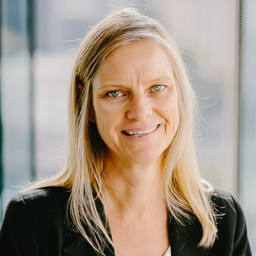 But you can use the Payment Registration process which will also result in a posted Cash Receipt Journal, but starts with a list of all open customer documents, and requires less data entry. Simply tick the invoices that have been paid, change the Amount Received if the invoice is short paid, then click Post. A cash receipt journal is automatically created, applied to the open documents, and posted. Enter the default journal batch and balancing account in Setup. Tick Payment Made for the invoices that are paid. Review the Date Received and Amount Received. Click Post Payments. This posting option is used to post one cash receipt journal line for each invoice paid. Payments for more than one customer can be posted at the same time. Tick Payment Made for the invoices that are paid. Review the Date Received and Amount Received. Click Post as Lump Payment. This posting option is used to post one cash receipt journal line for all invoices paid. Payments for only one customer can be posted at the same time. 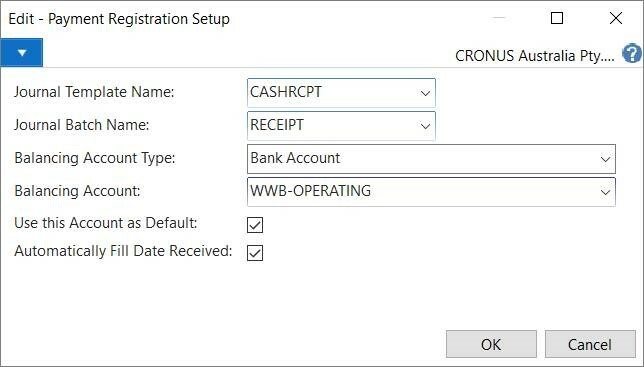 The Payment Registration function is an alternative to the Cash Receipts Journal. As well as providing an overview of open entries, the data can be filtered and sorted and the process requires less data entry.